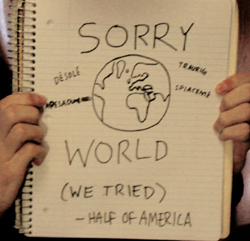 Sorry Everybody. You know, I don’t think we’ll really be out of material regarding this whole election/Bush/disaster thing, maybe ever. My take on it is toning down.. which doesn’t make it any less of a disaster.. but everyone’s right: wallowing in our disappointment and melting into despair isn’t going to save us or the rest of the world from the damage that’s not before us. So how to approach attempting to fix all of this? or at least how to really live with it..